Not to be used in conjunction with other offers. We reserve the right to limit or exclude certain items from promotion at our sole discretion. Not valid on items within the Corporate store. We reserve the right to cancel this promotion at any time without notice. Easter Delivery valid with Expedited Shipping within the contiguous United States only. Offer valid thru April 18, 2019 at 2pm CST. 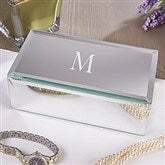 Give her a feminine keepsake she will treasure through the years by personalizing our stunning Reflections Engraved Mirrored Jewelry Box.